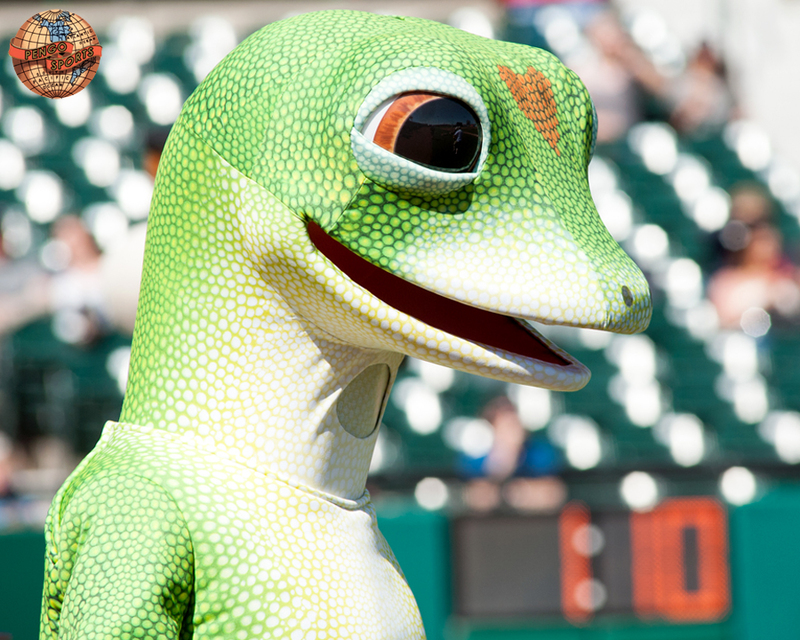 All hail our Reptilian overlords! One thing is for certain: there is no stopping them. The reptiles will soon be here. 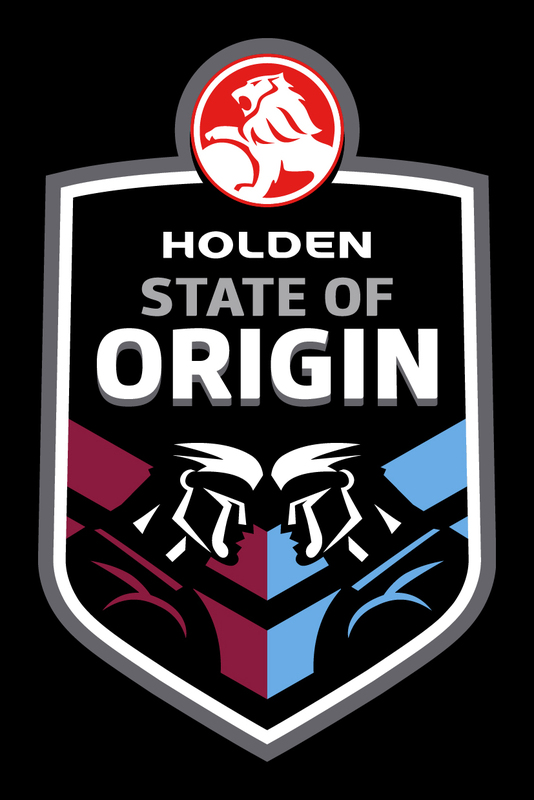 And I, for one, welcome the Annunaki to our humble stadium. I’d like to remind them that as a trusted sports photographer, I can be helpful in rounding up others to toil in their underground lizard caves. This Is His Land. And You Know It’s Rich With Gold. GOLD! 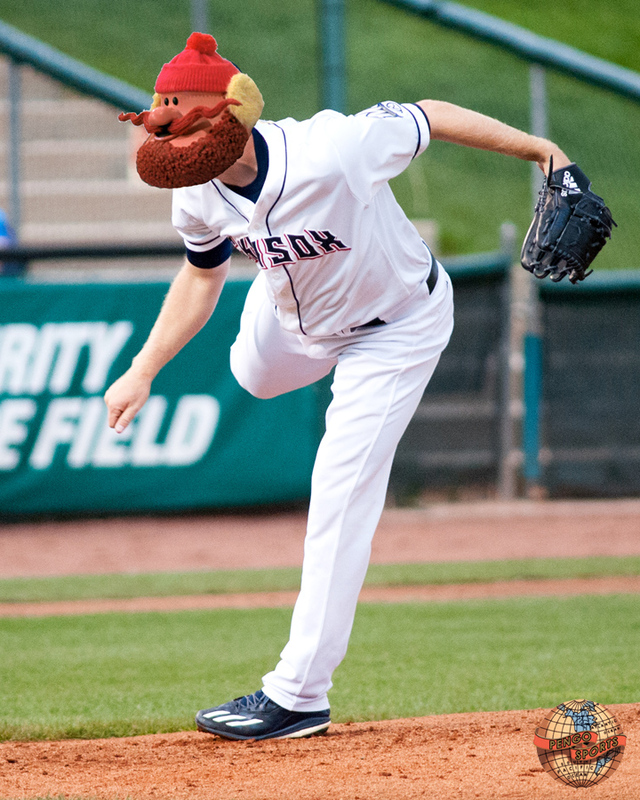 Colorado Springs ace, Yukon Cornelius Brandon Woodruff, goes tonight for the Sky Sox against Oklahoma City in OKC. Woodruff is 4-0 with a 1.61 ERA on the season, with 3 of those wins coming at Security Service Field at Mile High (a place not fit for man or beast. 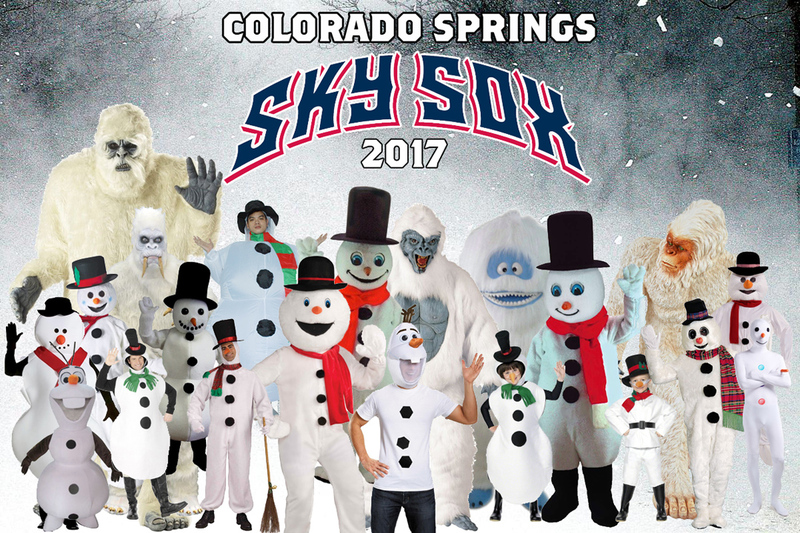 The ballyard is nothing but the Island of Misfit Toys with Bumbles running wild in the outfield). 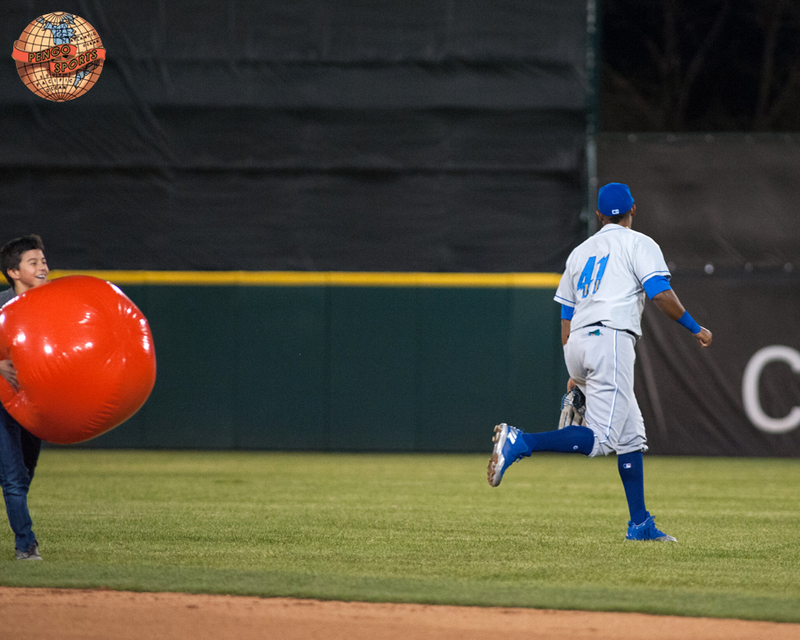 Good luck to Brandon, Rudolph & Hermey against the OKC Dodgers tonight! 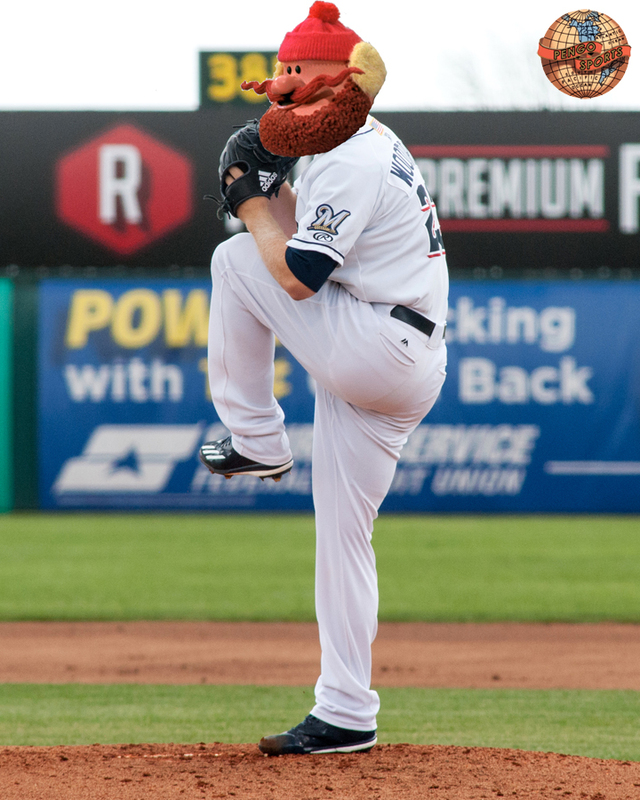 Nate Orf looks grumpy. Just a heads up. 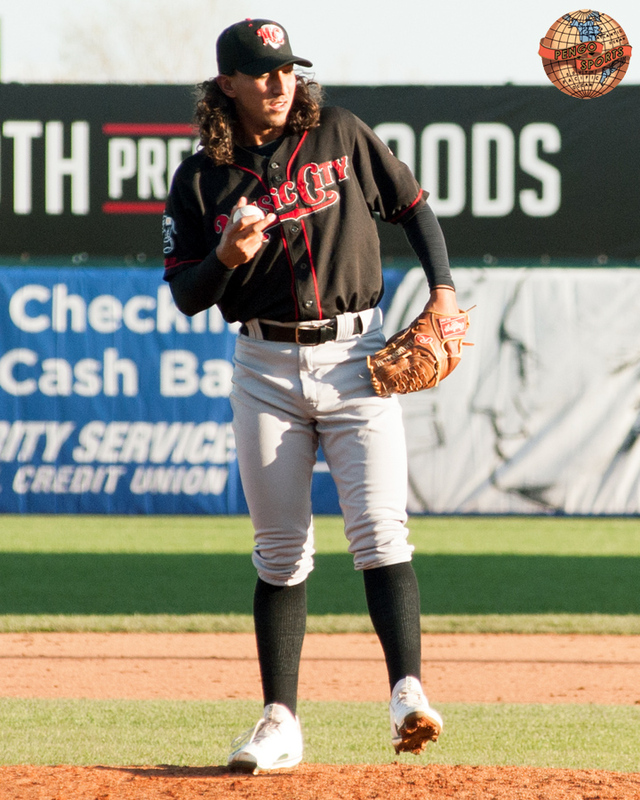 Color me shocked, but smooth jazz recording legend, Kenny G, seems to have changed careers and is now a relief pitcher for the Nashville Sounds. Mr. G, or Kenny, as he allows me to call him, has pitched in the first 2 games of the 4 game series, tossing 2 innings, giving up 1 hit & 1 run. Tonight has been declared KENNY G NIGHT! 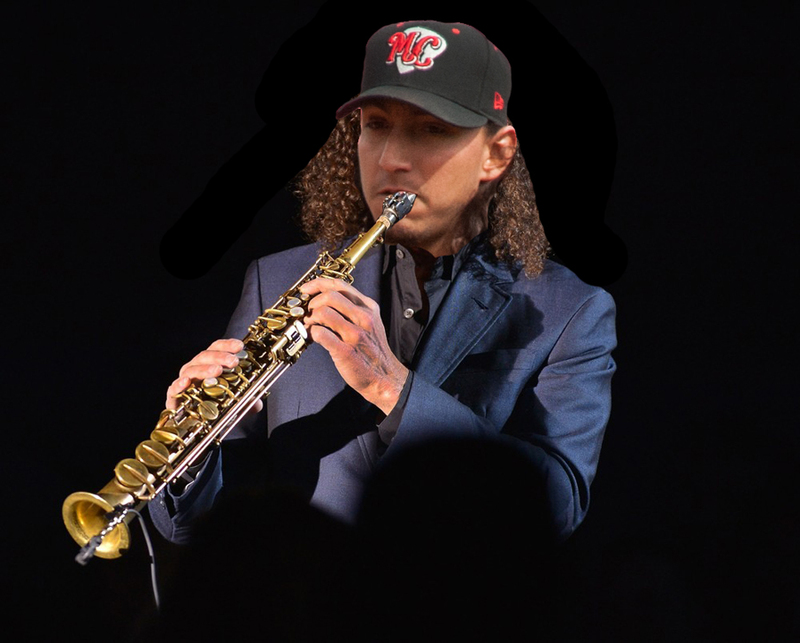 All game long, Kenny will entertain the crowd, from the bullpen, with some of his monster jazz hits like, Love Theme From Romeo & Juliet, the theme From Dying Young, and My Heart Will Go On (Love Theme From Titanic)! 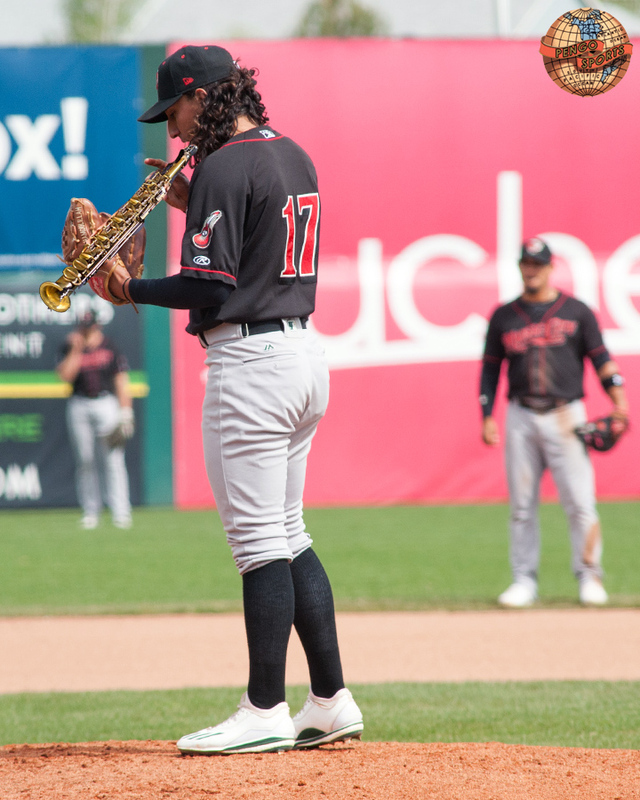 So, come on out to Security Service Field at Mile High, watch the Sky Sox take on the Sounds, and chill to the musical magic of Kenny G.
Concise, to the point, without any wasted words (though there is a lot of wasted space below that final paragraph). That’s mailing it in without even having to waste a stamp! Nicely done! The Omaha Royals Storm Chasers Kansas City Royals outfielder, Jorge Bonifacio, is a pip I tell you! A pip! 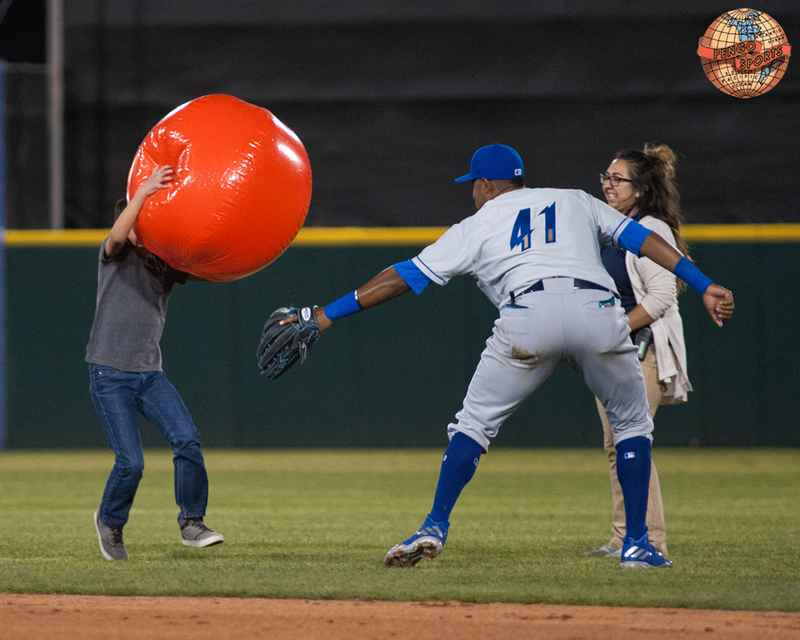 Here’s some kid, running with a giant, red ball, as part of some promo at a Colorado Springs Sky Sox game, getting his fair share of “the business” from Bonifacio. A good time was had by both. 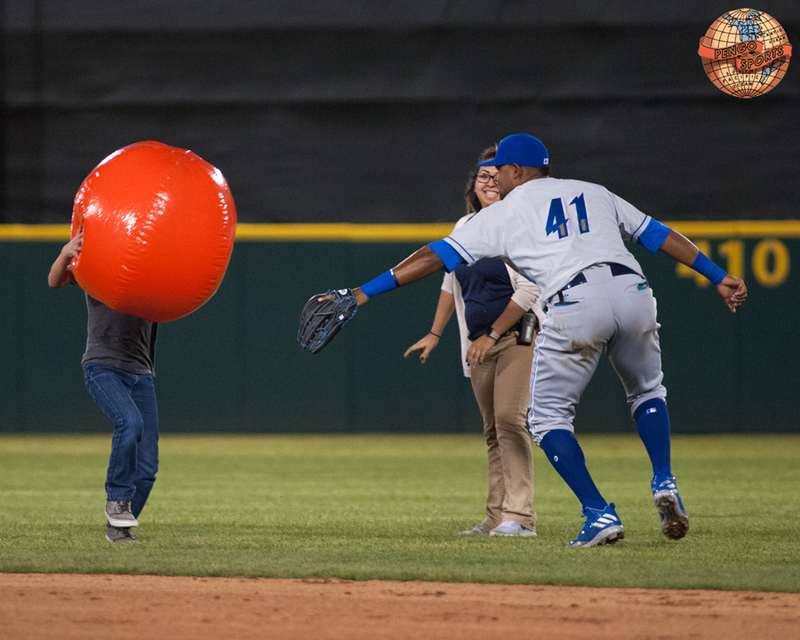 The kid won a year’s supply of giant, red balls, and Bonifacio made it safely to his position in right field. 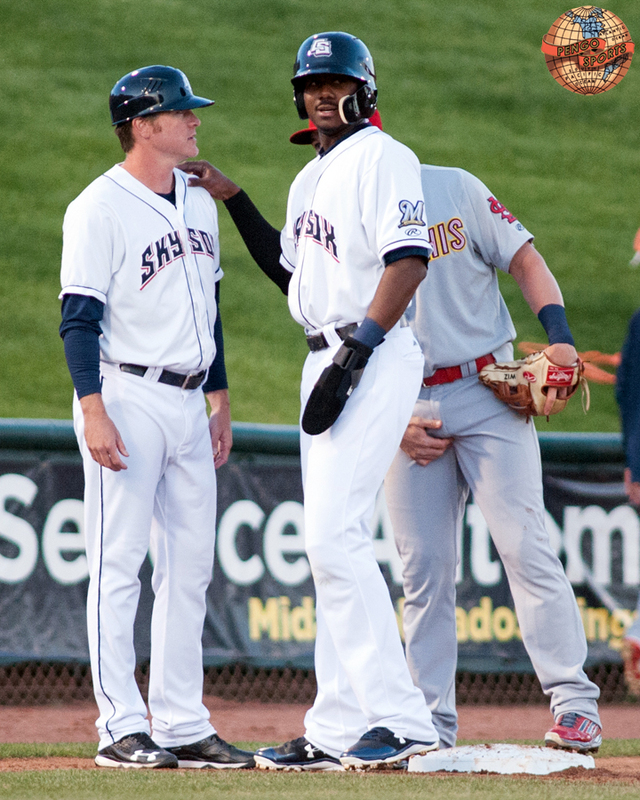 Congrats to Jorge Bonifacio, who was called up to the Kansas City Royals today. Good luck and keep on keepin’ on! Stop That! Just Stop That Right Now! 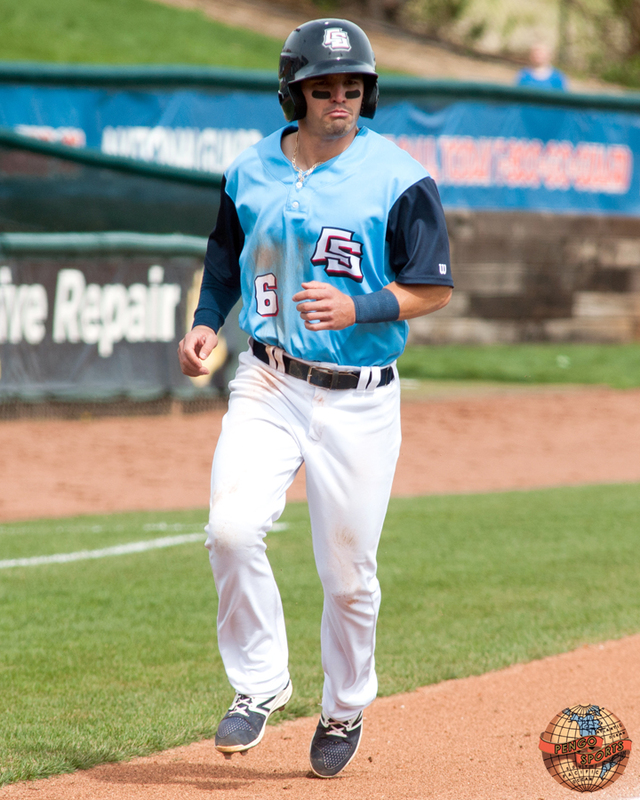 Would you look at Memphis 3rd baseman Patrick Wisdom? Would you just look at him! He’s freaking out the Brewers’ #1 prospect, Lewis Brinson, and Sky Sox 3rd base coach, Ned Yost, with all that touchy/grabby stuff he’s pulling over there. Seeing the error of his ways, Wisdom attempts to “wash” his “sinning” hand clean with some dirt. OH MY GAWD! HE’S AT IT AGAIN! Betcha he’ll be wearing a pair of glasses during today’s game. Won’t someone please think of the children. 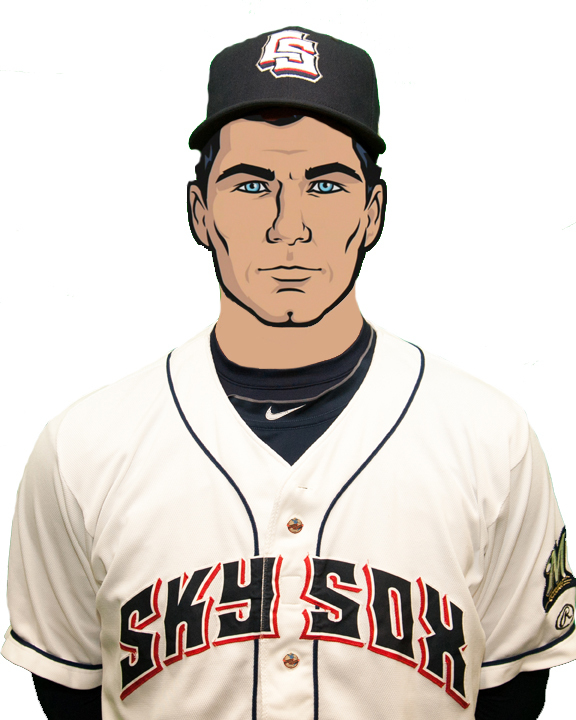 On April 10th, the Sky Sox called up the world’s most dangerous secret agent/relief pitcher, and star of the hit FXX show, ARCHER, Sterling Tristan Archer. 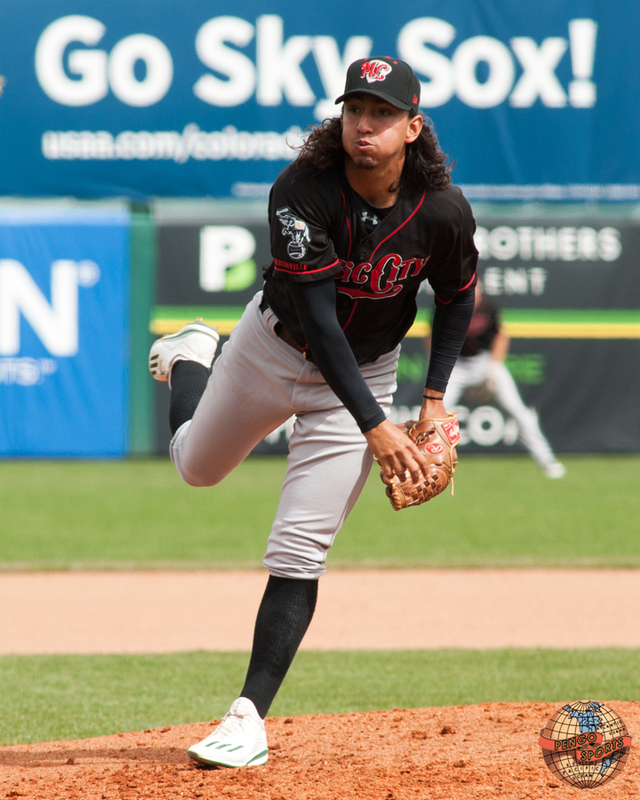 Since being called up from Biloxi, Archer has been in 2 games, pitched 3 innings, allowing zip-all with 3 k’s. According to his Wikipedia page, Tristan’s obsessions include Burt Reynolds, Kenny Loggins, and big cats such as tigers and ocelots. His biggest fears are: cyborgs, alligators, crocodiles, and brain aneurysms. 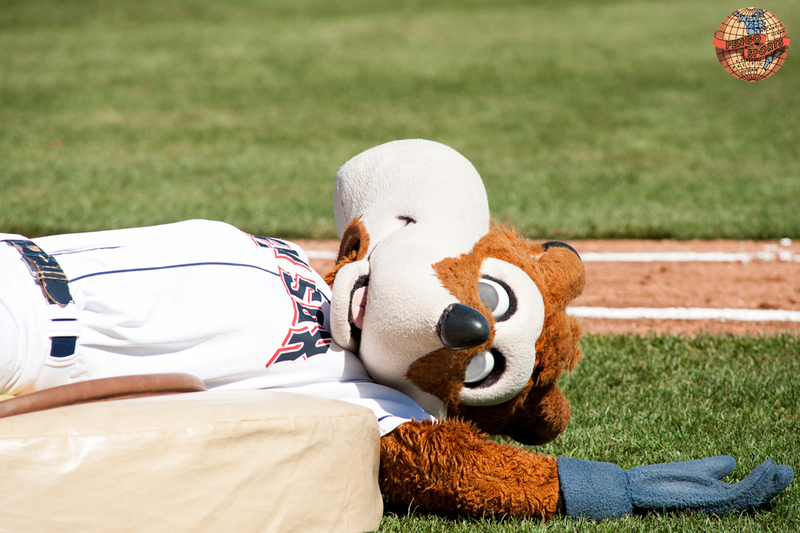 Crazed with rabies, drunk as a lemur, Sox the Fox had to be put down, Old Yeller style, last Sunday. In lieu of flowers eat a hot dog or something. Eric Sogard Breaks Bat! What Happened Next Will Disgust You! 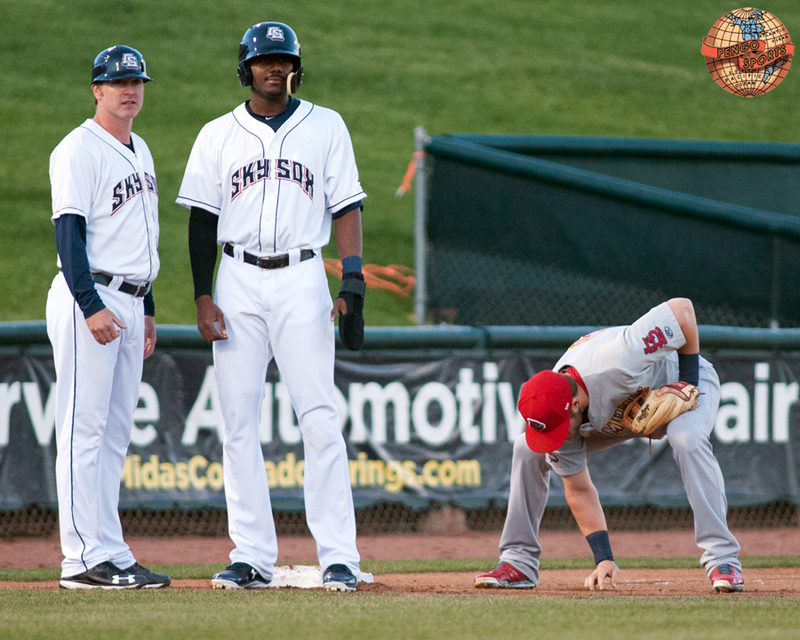 Last evening, Sky Sox DH, Eric Sogard, broke a bat at Security Service Field at Mile High. There were thousands of witnesses, yet the police stood around and did nothing. This is why we can’t have nice things. 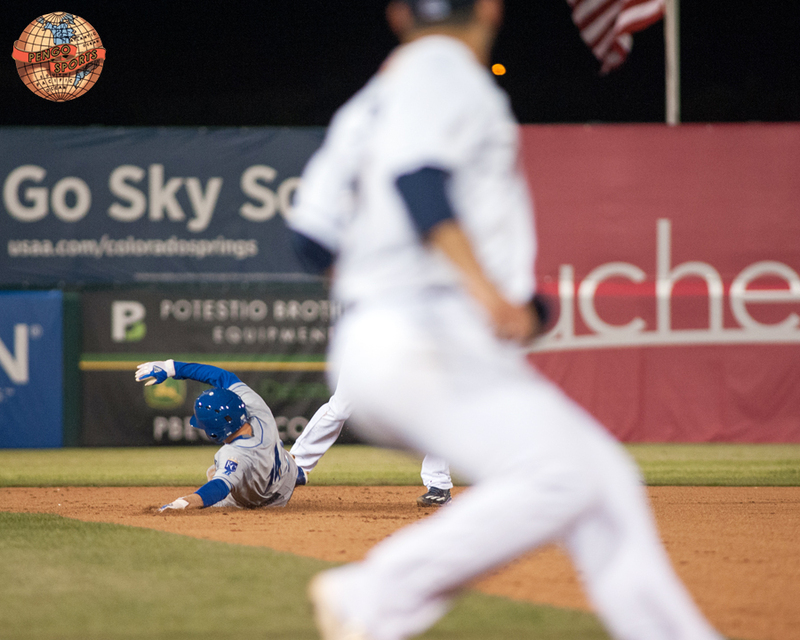 Yadiel Rivera gets the force on Omaha’s Billy Burns and attempts to turn the double play. 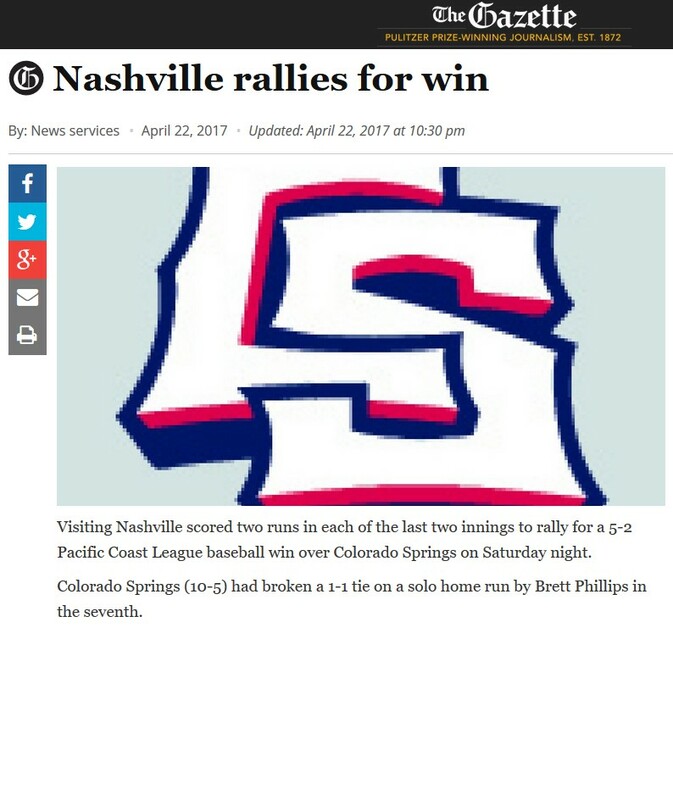 Sky Sox pitch Paolo Espino gets in the way and messes the whole thing up. 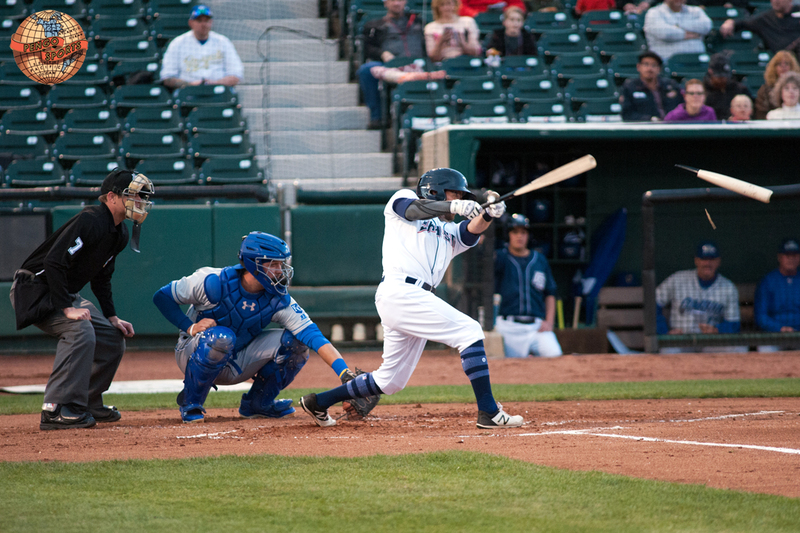 The Sox came back, twice, with 3 in the 9th & 10th, to win 8-7 over the Storm Chasers. It was snowy on team picture day, but at least that torquing, east wind stayed away. Anyways, Merry Christmas! And PLAY BALL! Hey, It’s The Bird! And He’s Doing Stuff. 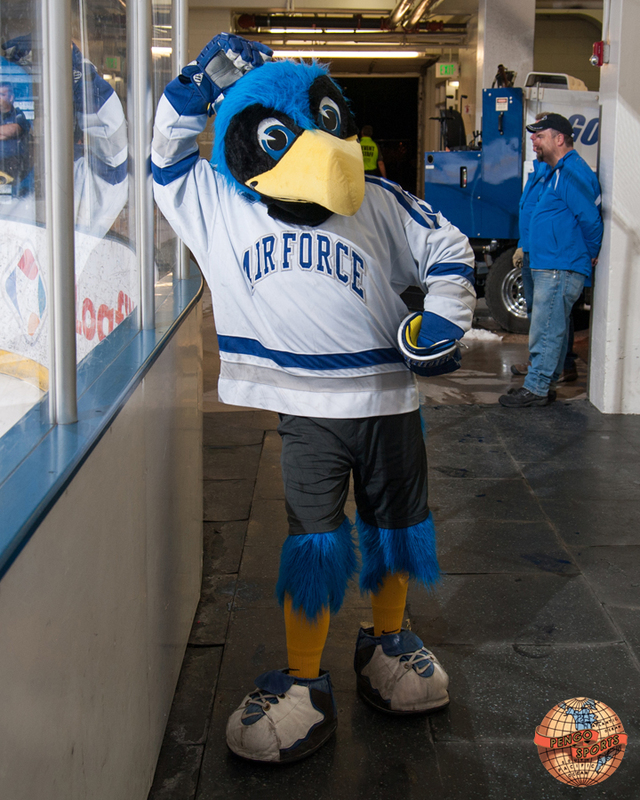 Air Force mascot, The Bird, guilted me into taking his picture on Friday. And here he is doing something else, airing out his pit I guess. I did what you asked Bird. Now would you please release my children, unharmed, liked you promised. Thank you. 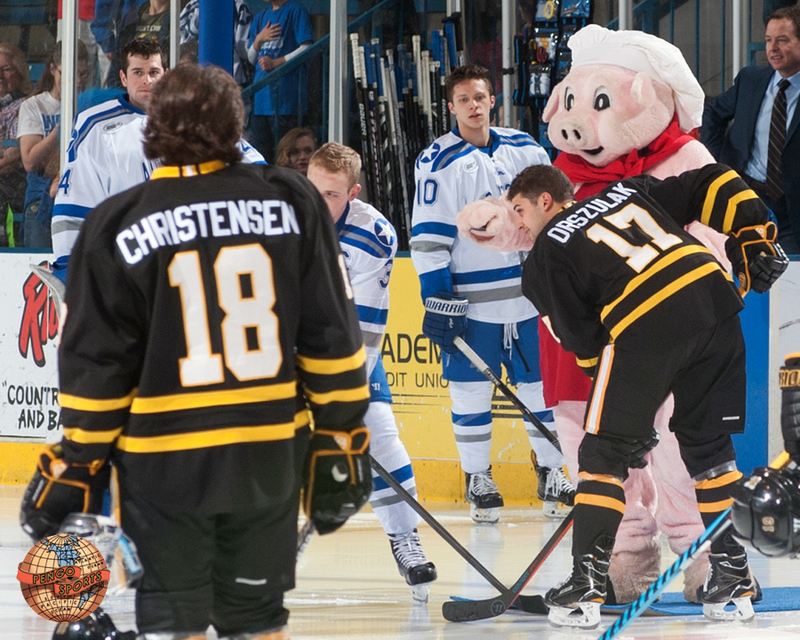 The Pig-Man! 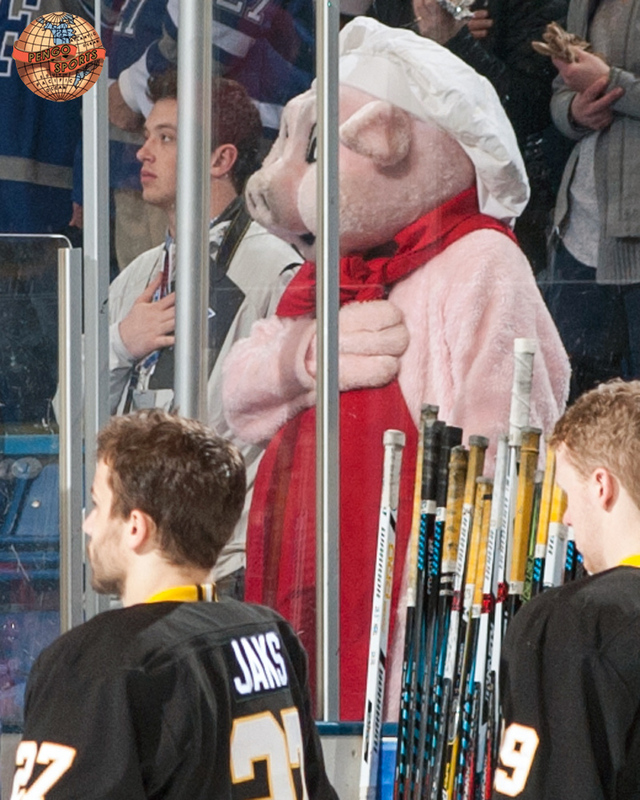 I Saw A Pig-Man! 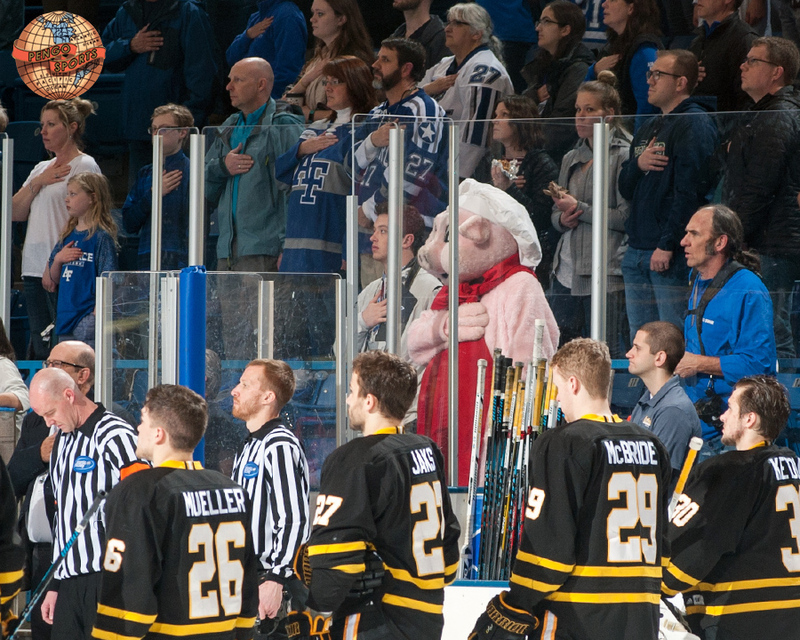 He may be a pigman, but pigman is respectful of our nation’s anthem. 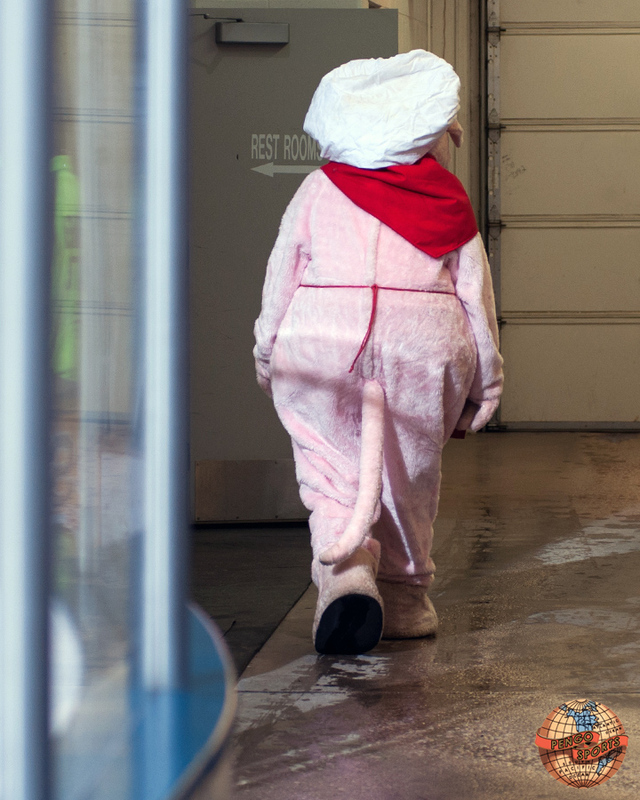 The pigman is off to take a dump. 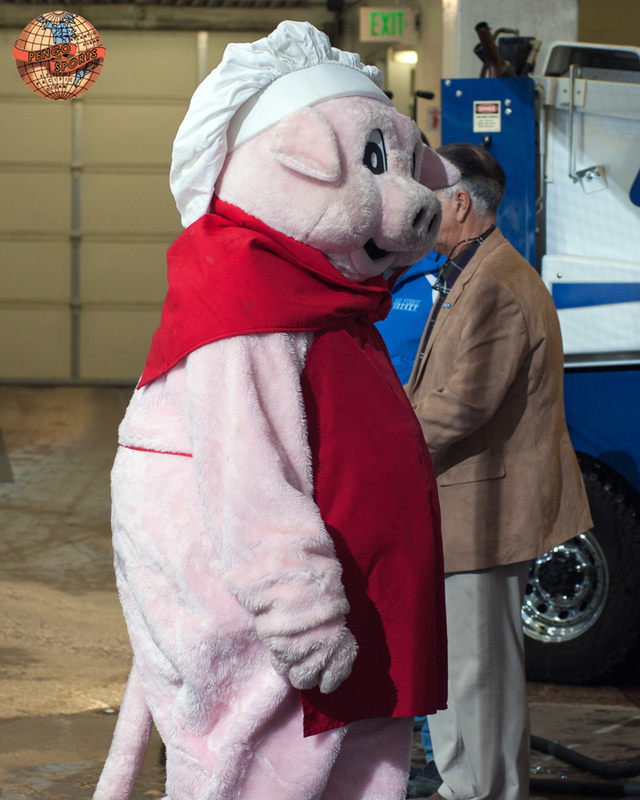 Godspeed pigman! 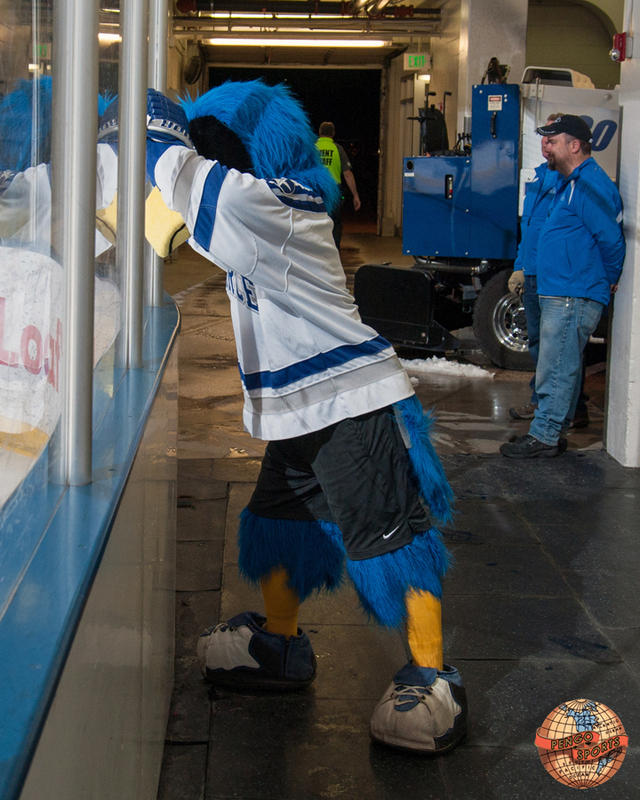 Oh, Air Force came back in this game, down 3-0, scoring 3 times in the last 4 minutes to earn a tie against AIC. I got tired of looking at that dead frog in the last post (I am bad updating content. 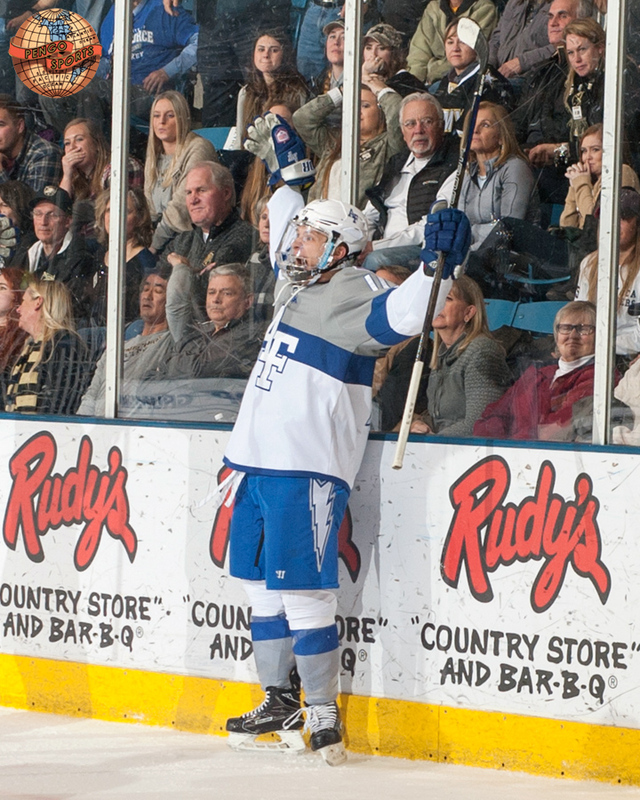 Sorry), so here’s a picture of Air Force’s Jordan Himley celebrating the game winning goal against Army West Point on Friday, January 27th. 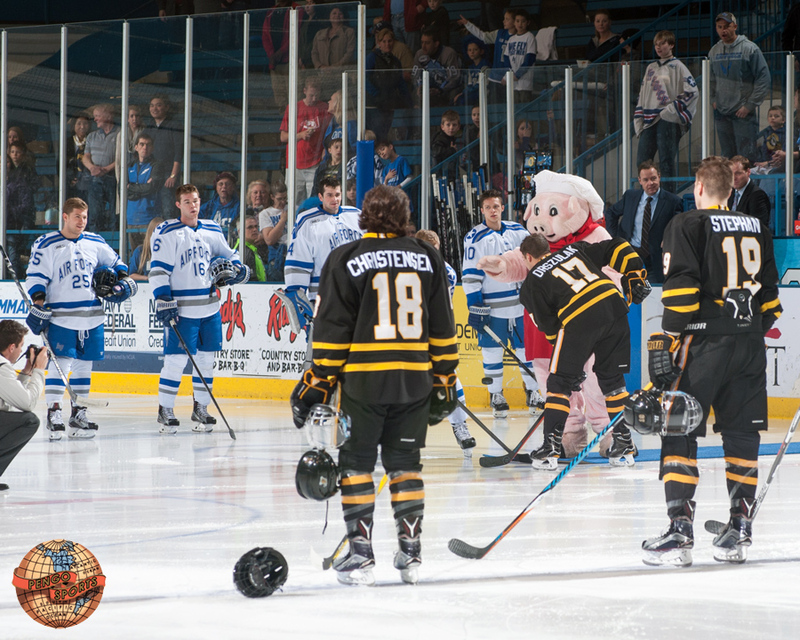 The glum folks behind Jordan are Army fans in the away fans section at the Cadet Ice Arena. 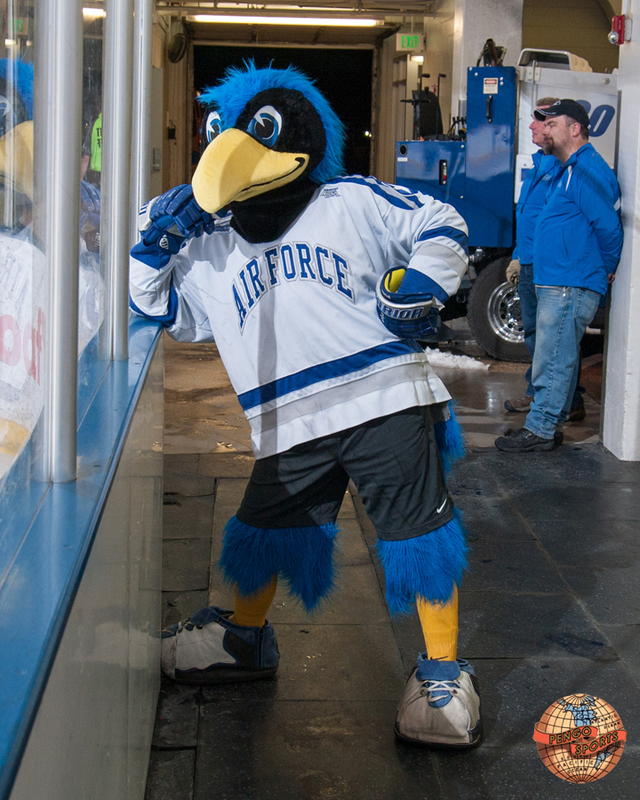 Air Force defeated Army 3-1 on Friday & 3-2 on Saturday to sweep the series.